It’s been a few weeks now since I lasted used gedit as my code editor. I used to only use it, but now I’ve become a converted Vim user. I was pretty efficient with my setup – my src folder open in the background, gedit to one side and a terminal on the other. 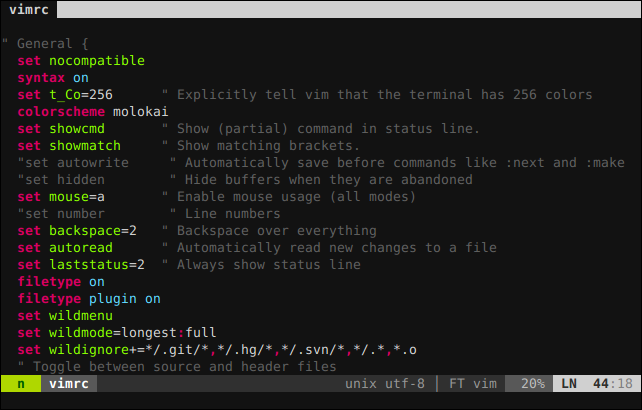 However, I have recently had quite a long holiday, so I decided to properly try switch to Vim. I had previously used Vim in small doses when I had to edit a file over an ssh connection, but the time for me to finally jump in the deep end had arrived. session plugin – Save and load all my open tabs with F5 and F6. 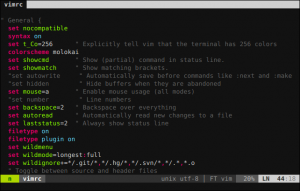 molokai theme – Who knew 256 colors could look so good? powerline plugin – Works as well as it looks. alternate plugin – Quickly switch between my code and header files. tagbar plugin – Jump around the current file with ease. yankring plugin – Cause everyone uses copy/paste. If you would like to see exactly how I got it to look like this, have a look at my vimrc. Undoubtedly I will continue to make changes to it, but for the moment, I am rather proud of it. I got the inspiration to write this post after reading this, so go read that too. This entry was posted on Wednesday, January 11th, 2012 at 19:27	and is filed under Linux. You can follow any responses to this entry through the RSS 2.0 feed. You can leave a response, or trackback from your own site.